Today marks the start of our ’12 days of Christmas’ giveaways – otherwise known as the #HoHoDodo Christmas giveaways! Last year we did this and it was a huge success and so we’re back to give more goodies to our friends this year! 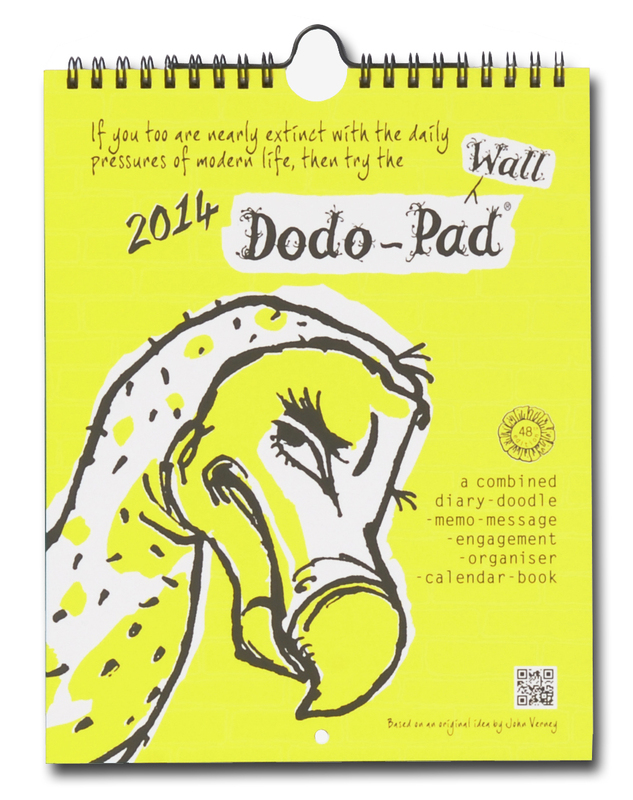 On this, the first day of Christmas, we’re giving away a Dodo Wall Pad to get 2014 off to a very humorous and organised start. To win this fabulous prize, all you have to do is comment below, telling us in no more than 25 words: WHAT IS THE FIRST DATE YOU PUT IN YOUR 2014 DIARY OR CALENDAR + AND WHY? I will put in my Silver Wedding anniversary on July 15th because we are going to have a whole year of celebratory treats. The first date I put on my calendar is my eldest daughter’s birthday on February 2nd. Birthdays always get written on first. The first date I write in my dodo diary is whether my husband is working on Christmas Day. He is a paramedic, works shifts and does not get to choose when to take his holidays so I have to work out if he is working or not by going through the entire diary writing his shifts until I get to Dec 25th. For my 2014 calendar, the first date I will be writing in is the 13th of January as my little boy has his first ever day of Nursery. I’m boring, I write the birthdays in first in their order so it’s my brothers birthday on the 13th January. 19th January, I have a fun day making music with friends. My mother’s birthday on 17th because if I forget her birthday the rest of the year may not happen for me! The first date I put in my new calendar is my baby cousin’s birthday, because he’s awesome and I love him! I copy the birthdays from the old Dodopad and increase the ages of the children by one year. Thus first in is Roya on 17 January. The EXACT same thing happens in the Dodo Towers household too 🙂 – after many years, some of their ages are getting quite scary! KIngfisher Chorale rehearsal dates–I’m the key-holder and need to remember to unlock and bring tea/coffee/choc for the year’s beginning on January 5th! I put in the date my son gets back home after spending Christmas with his father. Then we can have second Christmas with more presents. I’m a teacher (and also really sad) so the first dates I wrote in my 2014 diary were exam dates for January and June :-). The first date I put in my 2014 DodoPad was our first Teacher Only Day for the new school year. We have our long summer break over December-January, so now is prime planning time. I go back on the 23rd of January, the students start on the 28th. As father ted would say: My lovely horse running through the field. Where are you going with your fetlocks blowing in the wind… Answer: Hoof!